Tricia's Take: OOTD- Simply dressed! I am excited for tonight when I can sit and watch The Bachelor and watch for the sale news to come it!!! Love the outfit...even if it was a grab-n-go kind of morning! SImple or not this is a great outfit! 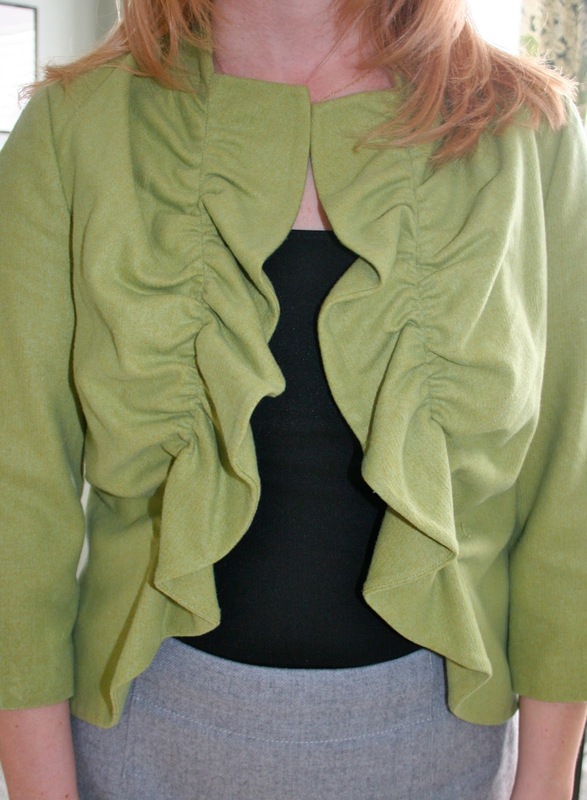 Love that green top...the ruffle egde is perfect! And the tights and shoes are a perfect finishing touch. I cannot tell you how many times I have made us late because I cannot decide what to wear to church. I now HAVE to figure it all out the night before or we'd never make it there by 9am!! I'll be owning my couch tonight as well...Bachelor and sale news are the highlights of my MOndays! =) Come on Volante Tee...PLEASE hit sale! So, so beautiful! I hate those days when you put on your clothes and they all seem so wrong. It's depressing. But you ended up wearing something super adorable! I love your green sweater/top. Really pretty, even if you were in a rush you look great and all put together. I loved the suits you chose too. I had no idea Anthro sold bathing suits. I love the idea of a 50's suit as well. Cute, I love that you kept it simple it works very well! well, for just being thrown together your outfit looks great! I have a '50s style swimsuit I got from Target last year - I was going to a conference with coworkers so I needed something extremely modest. I LOVED it - it felt young and stylish enough for me, but I was as covered up as a person can be in a swimsuit - but you're right, they do emphasize curves! the green looks beautiful on you!! i give up on sizing..every store is different..it is so annoying. i need to make/sew all my clothes..hahaha.. I love your green top - the colour is awesome and your shoes totally rock. Great outfit - you pulled it together fast! That green top is really cool...I've never seen anything like it! I hate when I have an outfit in mind but then when I put it on it doesn't feel right. What makes it worse is if you're on you way out! Well, clearly you work well under pressure bc this is a great look!!! Yes, I have many a morning like that...sigh. This celery green shade is beautiful on you! And what about Down East Basics Swim? I am impatiently waiting for them to roll out this year - last year I wanted a suit but couldn't find matching pieces both in my size and was so frustrated - I'm going to shop early this time! I definitely have A LOT of those days when everything I was planning to wear just goes down the tubes. Blech! And I'm so bummed to hear that the Natalie swimsuit didn't work on you -- it looked so promising online! Especially the polka-dotted colorway... But on a more positive note, I love your tights and heels! Such a perfect pop to your outfit!